Here it is: our PlateJoy review for 2019 after using it for a month for our family of four. Lately, I’m so busy that it’s a huge struggle to plan our families’ meals in advance, so our family is eating the same thing over and over. Honestly, I’ve thrown out too many things in the fridge. I buy the ingredients, forget I have them, and then throw them away. Sound familiar? So when PlateJoy reached out to see if I wanted to try their meal planning service, I jumped at the chance. 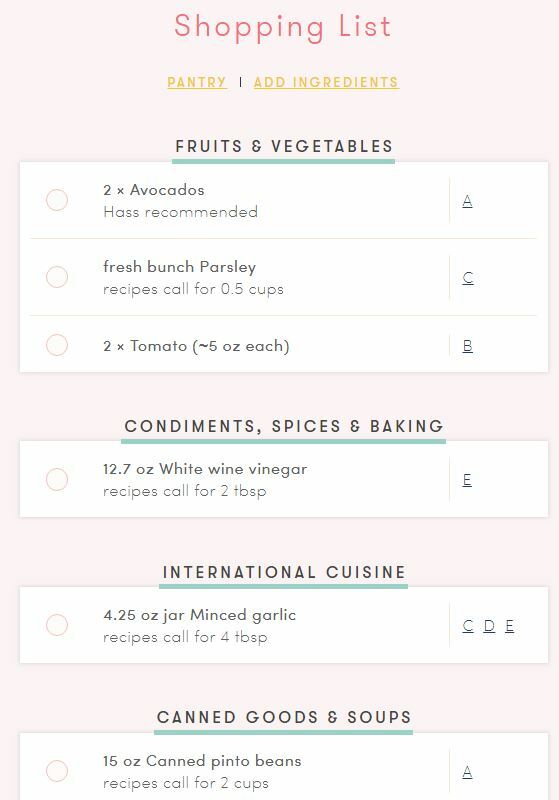 An app that plans my meals, and shopping list automatically? Count me in! What is Plate Joy? 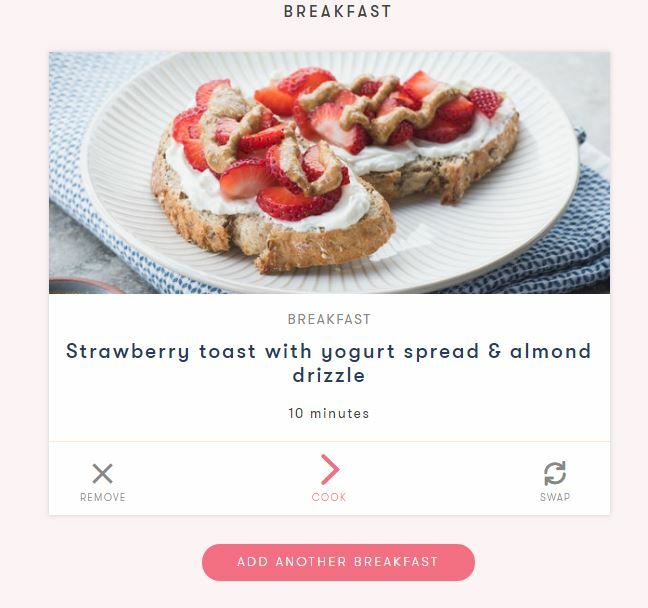 It’s a meal planning website (there’s an a app, too) that creates recipes and a shopping list for your family. Curious and want to try PlateJoy for free? Sign up for their 10 day free trial here! Use code PARENT10 to save $10 on any PlateJoy Plan! Save time. It can save you time, since you’ll be able to meal prep ahead of time, and shop more quickly. Save money. It can save money, since you may order out less, and you’ll cook at home. More variety. There will be more variety in your diet, since you’ll be less likely to default to cooking the same old things. Less waste. Since your meals are pre-planned, you can buy exactly what you need at the store, and avoid waste. 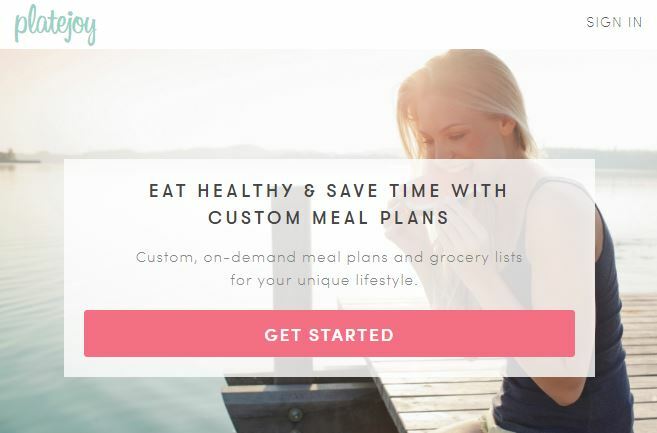 I was a nervous about trying a meal planning service, since I wasn’t sure it would be flexible enough for us. One of my kids a typically picky eater (the other is a rock star and will try almost anything). The kids and I are vegetarian, though we eat dairy and eggs that are cooked in food. My husband, however is a standard omnivore, with a love of all things bacon and chicken. To top that off? I’m focusing on eating healthier for the whole family, with fewer carbs and a little more protein. I was wasn’t’ sure that a meal planning service for families would be able to handle all of our dietary needs. To get started, just go to the PlateJoy site. Use code PARENT10 to save $10 on any PlateJoy Plan! Click here to go to PlateJoy! You can either choose the free 10 day trial, or start a paid plan right away. Use code PARENT10 to save $10 on any PlateJoy Plan!Use Promo Code: GET10 at Checkout to get $10 off! Create a new user account using your email. This takes about 20 seconds. This is where it gets fun. 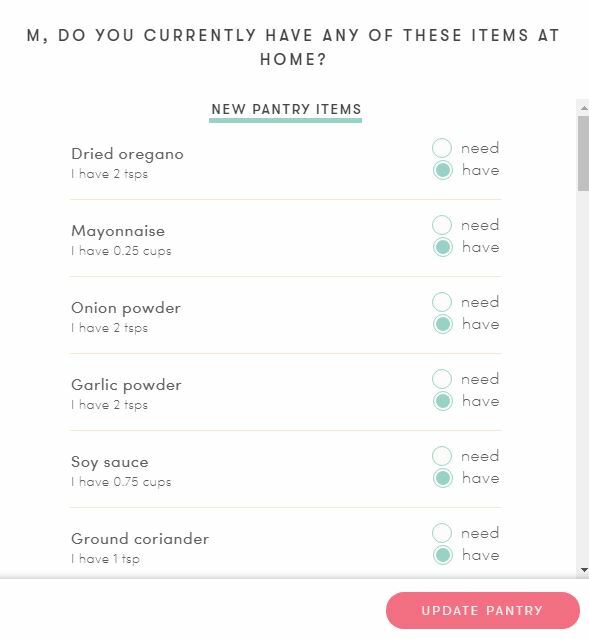 PlateJoy asks a bunch of questions to help personalize your menu and shopping list. They get pretty detailed, which is great. Don’t skip this step! 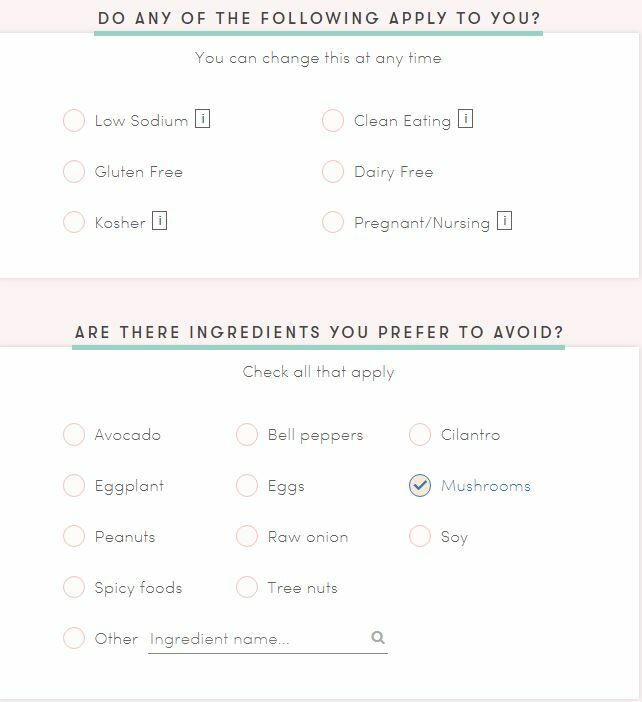 What I really love is that there’s a section where you can ask PlateJoy to eliminate specific ingredients. My hubby hates mushrooms, so we checked that off! You can even search for specific ingredients! It even asks what kind of equipment you have in your kitchen. For example, we don’t have an instant pot (I know, we’re probably the only people in North America who don’t have one! ), so I didn’t check that off. 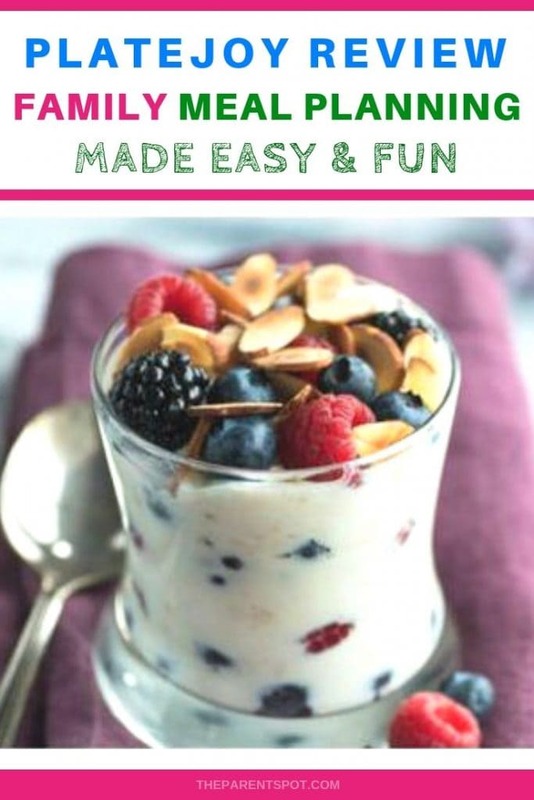 PlateJoy then gives you a list of recipes for breakfast, lunch, dinner, snacks and desserts. If you don’t like a recipe, you can remove it permanently! 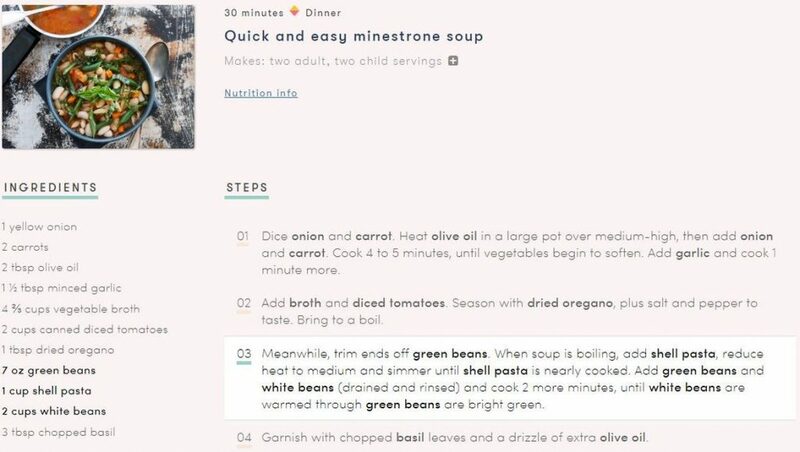 The other recipes will end up in your queue for weekly meal plans! You can even search for specific ingredients or recipes, and add more recipes to your queue. Next, you get to see the weekly personalized meal plan! Yum! Mine looks delicious right from the start! If you don’t like what you see in your menu, you can easily press the button to swap it out! Next, you can take a look at your grocery list for the week. What I love is that you can check off ingredients that you have in the pantry already. That way, they won’t end up in your grocery list! I LOVE this feature! And there you have it! My shopping list for the week. I love that it’s so small – we have a pretty well stocked pantry, so there wasn’t much to get! 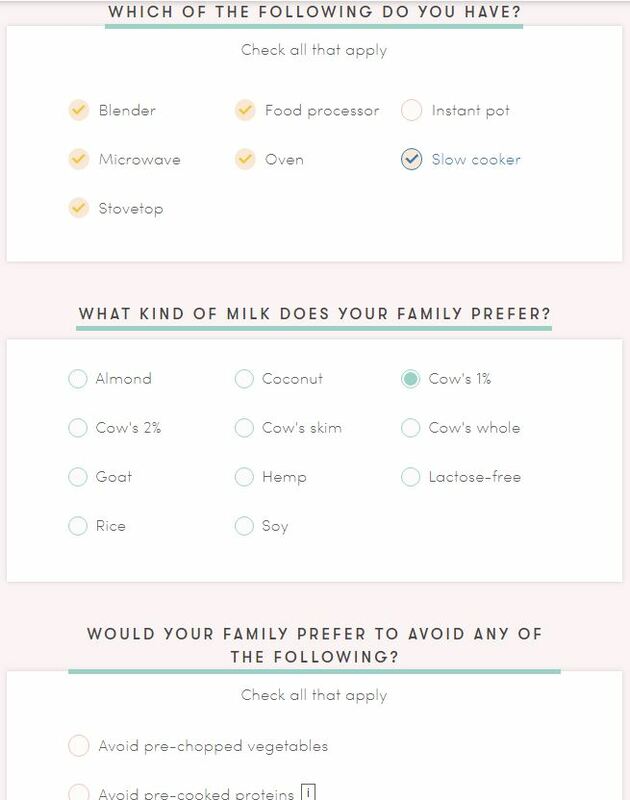 There’s even optional grocery delivery to make your life easier. Once the grocery shopping is done (and it took almost NO time, since the list was so small), it’s time to grab the recipe and get cooking! I LOVE minestrone soup, so this was my first pick. The recipe was easy to follow, and delicious! 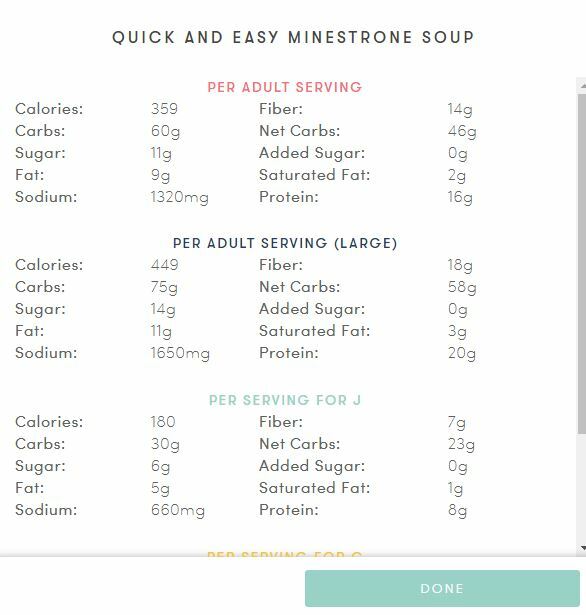 What’s really cool is that you can just click in the recipe and see all of the nutrition info right there! 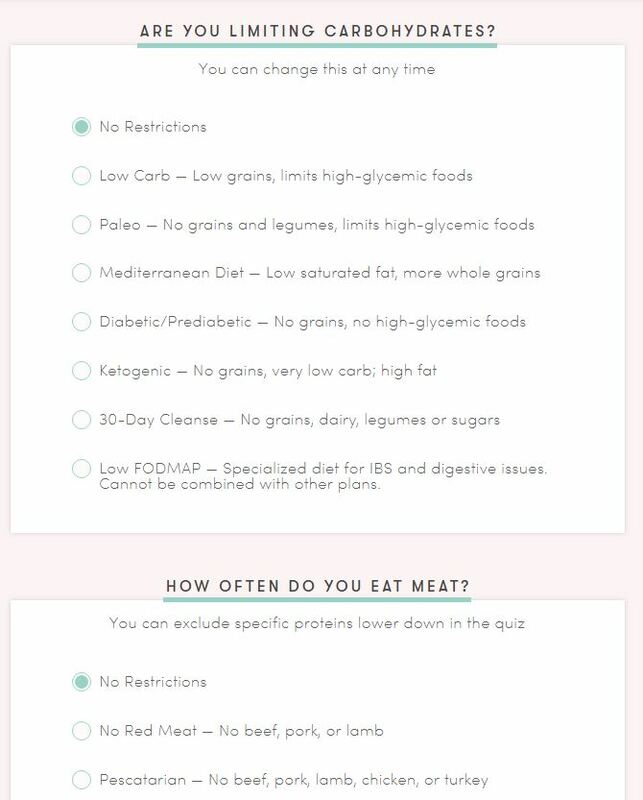 You can even connect your Fitbit, and there’s an on demand nutrition coach if you have any questions! Once you’re signed up, grab the PlateJoy app (Google Play and iOS). I really love being able to see my meal plan and recipes when I’m away from my computer. 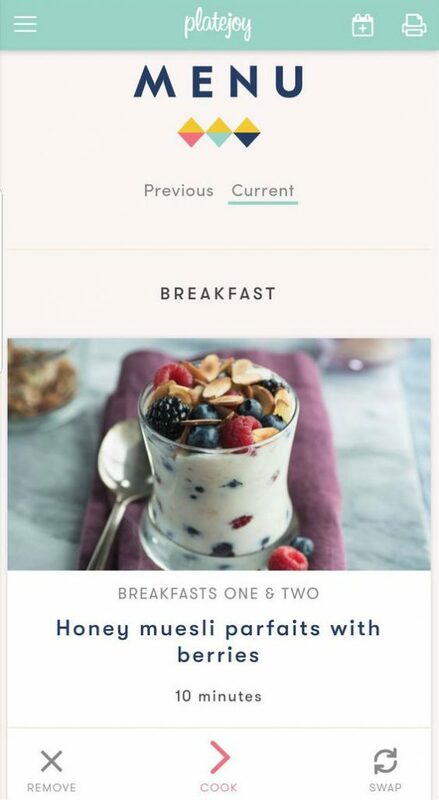 Having recipes on the app on my phone is especially useful for when I’m in the kitchen cooking! Overall, I was impressed with PlateJoy. It was incredibly easy to use, and I really loved that it was so simple to personalize. This is a small thing, but since I’m vegetarian I use some less common ingredients like tempeh, paneer, and nutritional yeast. I didn’t find a lot of recipes with those ingredients, unfortunately, though the ones they did have sounded delicious. Is PlateJoy better than a meal delivery service like HelloFresh or BlueApron? Well, that really depends on what you want. Meal kit delivery services send the ingredients and recipes to your door. There’s no shopping, but you still have to cook. They do save some time buying ingredients, but they are quite a bit more expensive (which makes sense, considering they also include food), and there’s a fair bit of packaging waste. I really like meal kit delivery services when I’m in a complete crunch for time, and I want to try something new. Check out our review of HelloFresh here. All that said, I find that PlateJoy and other family meal planning apps are a nice alternative to planning meals all on my own, and either eating out or getting a meal kit. 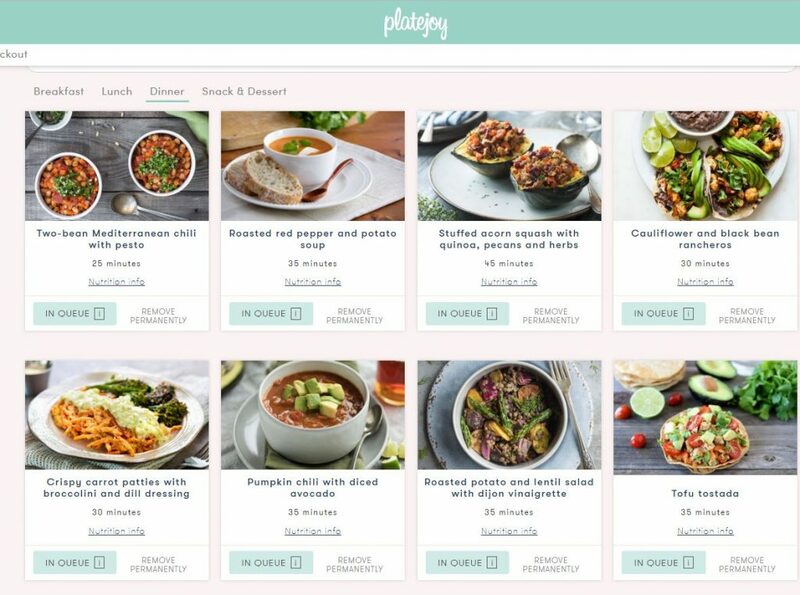 I think PlateJoy is a reasonable price, and it saves me a lot of time meal planning, and they give me new recipes I may not have tried. 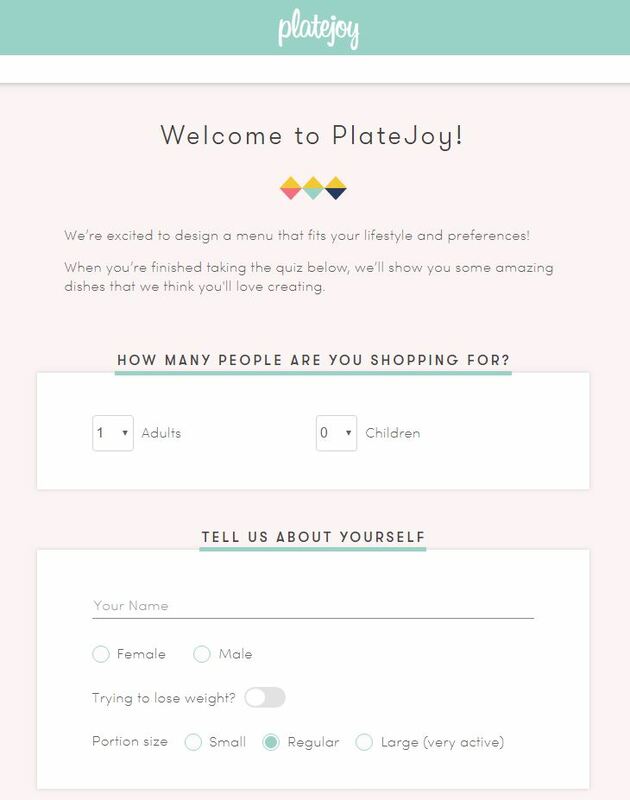 What if I don’t like PlateJoy? Can I cancel? You can cancel any time, but they don’t offer any pro-rated refunds. Is there a Platejoy app? Yes, there’s an app, on both iOs and Google Play. I really love it for making recipes with my phone nearby in the kitchen. Is there a Platejoy free trial? Yes, there’s a free 10 day trial for PlateJoy. You can access the 10 day free trial here! How much does PlateJoy cost? 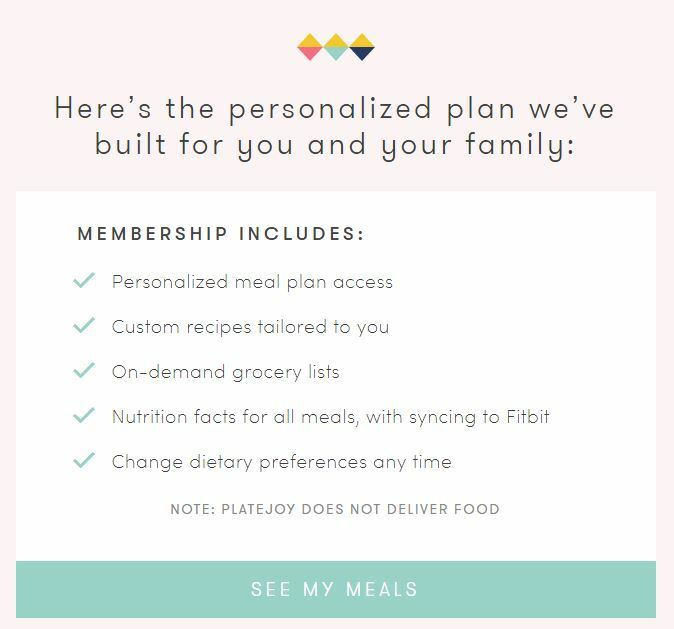 A meal planning subscription with PlateJoy costs $69 for six months, and $99 for one year. That comes out to about $8 to $12 a month! The cost doesn’t include food. Want to sign up for PlateJoy? To start start a paid plan right away, use Promo Code: GET10 at checkout to get $10 off! Use code PARENT10 to save $10 on any PlateJoy Plan! Do you have a PlateJoy review? Add yours in the comments – we’d love to hear from you!